Ichthyosis is a family of genetic skin disorders, distinguished by scaling and dry skin that may be very thin or thick. The prefix “Ichthys” takes from the Greek root word fish. 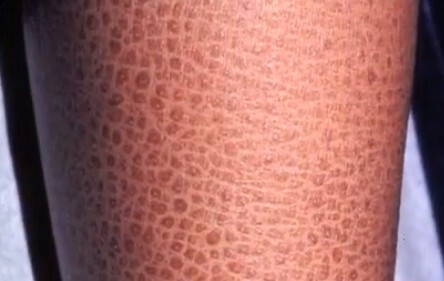 The scales of Ichthyosis Vulgaris, at times, called fish skin disease or fish Fish scale diseases, This can be present at birth, but typically first appear during early childhood. Each year more than 16,000 babies are born with some for of ichthyosis. Occasionally, mild cases of Ichthyosis Vulgaris go undiagnosed because they are mistaken for dry skin. Ichthyosis affects people of all ages, races, and genders. There are five specific types of inherited ichthyosis are called the follows: Ichthyosis Vulgaris, epidermolysis hyperkeratosis, lamellar ichthyosis, congenital ichthyosiform erythroderma, and X-linked ichthyosis. Most situations of Ichthyosis Vulgaris are mild, but some are severe. Sometimes other skin conditions, such as the allergic skin condition eczema, are associated with Ichthyosis Vulgaris. No cure ha has been found for Ichthyosis Vulgaris, and treatments focus on controlling the condition. The scales normally appear on your elbows and lower legs and can be particularly thick and dark over your shins. Most cases of ichthyosis Vulgaris are mild, but some can be challenging. The severity of symptoms may vary broadly among family members who have the ailment. Symptoms normally exacerbate or are more pronounced in dry, cold surroundings and tend to become better or even resolve in warm, humid environments. If you suspect your or your child has Ichthyosis Vulgaris, talk to your family physician or a dermatologist, He or she can diagnose the condition by evaluating the characteristic scales. Also be sure to seek medical advice if the symptoms worsen or don’t improve with self -care measures. You may need stronger medications to manage the condition. Ichthyosis vulgar is commonly caused by a genetic mutation that’ inherited from one or both parents. Children who inherit a defective gene from just one parent have a moderate form of the disease. Children with the inherited or genetic form of the disorder regularly have normal skin at birth, but develop scaling and roughness throughout the first few years of life. If genetic abnormalities are not responsible for ichthyosis, it is referred to as acquired ichthyosis. It is usually related to other diseases, such as thyroid diseases, HIV/Aids or cancer. Some people with ichthyosis may also experience the following complication. Overheating – In rare cases, the skin thickness and scales of ichthyosis can interfere with sweating, This can inhibit cooling. IN some individual, excess sweating (hyperhidrosis) can occur. Secondary Infection. Sink splitting and cracking may lead to infections. A physician often can make a diagnosis by examining the affected skin and the characteristic scales. He or she may perform another test, such as a skin biopsy. This may be necessary to rule out other causes of dry, scaly skin. There is no cure for ichthyosis, nevertheless, directed researchers and physicians have and continue to develop effective ways to help manage the disorder. Parents are also playing a critical role in sharing different types of treatments they are receiving with fellow parents of affected children and affect adults. Ichthyosis Vulgaris does not have known cure, so the goal of treatments is to manage the condition. Exfoliating creams and ointments, Prescription creams and ointments comprising alpha hydroxy acids, such as lactic acid and glycolic acid, help control scaling as well as increase skin moisture. Oral medication – Your physician doctor may prescribe vitamin A-derived medications called retinoids to decrease the production of skin cells. Side effects from the medicine may include eye and lip inflammation, bone spurs and hair loss. Self help measures can help you improve the appearance and feel of damaged skin. Here are a few recommendations. Take a long soaking bath to soften your skin. Use mild soaps. Rub damped skin likely with a rough textured sponge or loofah; you can also use a pumps stone to help remove scales. After showering or bathing, you can gently pat or blot the skin dry with a gentle cloth so that some moisture remains on the skin. Applying lubricating cream or moisturizer while your skin is still wet from bathing. The moisturizer should also have propylene glycol and urea, which chemical that help keep skin moist. Petroleum jelly is another good selection. Use a portable humidifier or one attached to your furnace to add moisture to the air inside your home to help prevent your skin from drying out. Apply an over-the-counter product that contains lactic acid, urea, or low concentration of salicylic acid twice daily. Mild acidic mixtures help skin shed its dead skin cells. Urea helps bind moisture to the skin.